Here we have some wolf pups, really at the point where exploration is starting to be possible. As you can see, there’s no shortage of curiosity in these little ones! Pups are born completely blind and deaf (but have a keen sense if smell), depending on the their mother and other members of the pack. The whole pack takes care and raises the pups (non-breeding females produce milk and males compete to baby sit). Usually four to six pups are born together. This is called a litter, and the pups in a litter are called litter mates. Pups are born inside a den. A den is sometimes a small cave or a hole dug out of the ground. The den must be big enough for the mother and her pups. It shelters them from the weather and protects the pups from other animals that may want to hurt them. Packs sometimes use the same den year after year. At other times, they make or find a new den each year. Pups grow inside their mother for about 63 days before being born. At birth they weigh only one pound, and their eyes are closed. Pups grow quickly. About 12 to 15 days after they are born, they open their eyes. 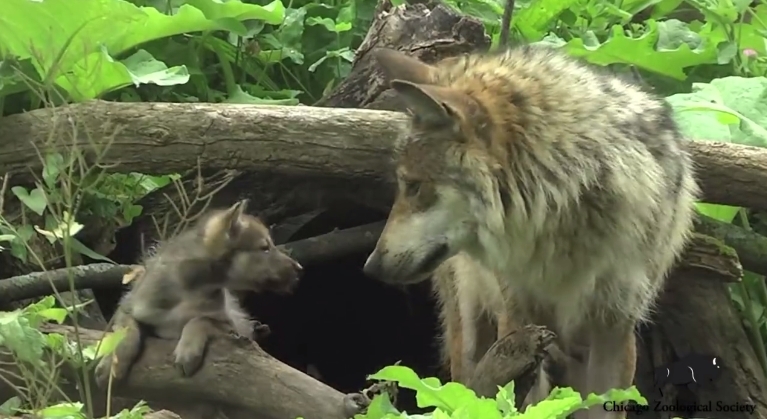 By two weeks of age, the pups can walk, and about a week after that, they may come out of the den for the first time. At first, they live only on milk from their mother. Responses to "Some Little Ones Learning How to “Wolf”"